In 1999, two meteorites, from the Mars’ region of the Solar system, penetrated the atmosphere and reached the Oman desert. A few years later S.T.Dupont embedded some fragments from these meteorites in a seal of pure red Chinese lacquer, representing the Red Planet, and created Mars Limited Edition. 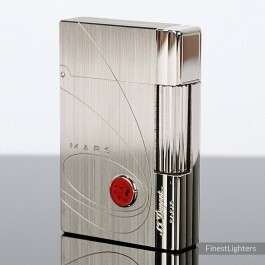 The lighter is engraved with the orbits of the planets and is finished in brushed palladium (platinum). The lighter is limited to only 300 individually numbered pieces (very rare).